Quora, a new startup founded by ex-Facebook employees, has closed a first round of funding, and it’s a big one. Benchmark Capital has led the round and general partner Matt Cohler has taken a board seat at the company (Cohler is a former Facebook exec). Both Quora and Benchmark have confirmed the funding, but they won’t comment on the size of the round or the valuation. Our source for the story says it was an $11 million round that valued the company at $86 million. Additional investors may join the round as well. Elevation Partners was also rumored to have bid aggressively on the deal. 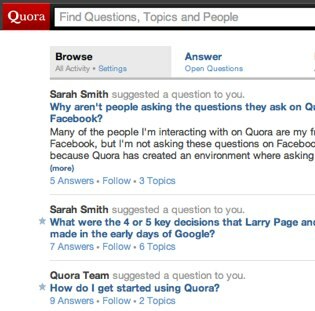 Quora first launched in private beta on January 4, 2010, just a few months ago. To get in you have to convince a current user to use one of their ten invitations on you. It’s one of the hottest private beta tickets in town. And for a question and answer site that’s saying something. But there’s a magic to Quora that has captured Silicon Valley’s imagination. Something about the quality of the people and the content. Real discussions break out on Quora all the time. The signal to noise ratio is extremely high. I sat down with Cofounders Adam D’Angelo and Charlie Cheever, and new investor Matt Cohler, to talk with them about what makes Quora so special. My notes from the interview are below. When will Quora launch publicly? There’s not going to be a big sudden open. We’re going to gradually open things up over time. One thing we’re really focused on is just getting high quality content on the site, and there’s a tension between suddenly letting in everyone when we don’t have policies and procedures to manage them. We de want to get a lot of users, we just want to be ready for them. Ready for them from a scaling standpoint or a community standpoint? Community management product and policy standpoint. What were some of the early product ideas that you had that you threw away? How did the process go from “we’re going to start a company” to what it is today? We knew we wanted to do a question and answer system. We didn’t know exactly how the details were going to work. Over the first six months starting a year ago, we were still doing a lot of the details and figuring out how the product was going to work. From that point on, it was just executing on building the product. With all the Q&A sites already out there it seems like this was a saturated market. Why go in this direction? We didn’t actually say that this is a market that we want to be part of, and we weren’t actually focused on the other Q&A sites. The way we think about this is there’s actually a lot of information that’s still in people’s heads that’s not on the internet. And when you think about it you would say that probably 90% of the information that people have is still in their heads, not on the internet. So we’re trying to get that information out of people’s heads, so it’s not on sources that are hard to access on the internet, and get it into a really useful format to make a valuable database. What makes Quora so special? Why are people raving about it? I don’t think it’s any one thing, but it’s a bunch of little things. Part of it is the right audience. Instead of just Q&A, we think about this as blogging. Some people call it inverse blogging or reverse blogging. When you write a blog post, you write to your audience. When you write on TechCrunch, you know that these people are expecting techie news about startups. When we worked on building the infrastructure for the product we also worked on building a website that works in realtime, so you can be up to date and it feels really alive. People say they feel smarter after they use Quora. Quora is an insiders’ forum for Silicon Valley right now. At some point, how does this not become Yahoo answers, which is just a little bit of everything but not really deep on anything? Why did you decide to get outside funding? I imagine that you could have continued to fund this for the foreseeable future on your own. We think this is a really challenging problem. When you think of all of the abstract knowledge that is in people’s heads and getting it into a useful format and getting it on the internet. We think it’s going to take a lot of work and it’s going to require a lot of really smart people, and this funding is going to let us do that. And this gets Benchmark involved. And it gets Matt involved. We’re hiring engineers and designers, that’s another reason why we raised this money. To grow quickly and hire a lot of smart people, because we’re going to need them. As the service grows how will you avoid “pulling a Twitter” and having massive downtime? I’m pretty confident we can deal with the scaling challenges. Community management is a big thing and the information here is so rich. These are the things that smart people need to work on and figure out. Matt, why is this an interesting investment for you? Because the people are extraordinary. That and they’re going after a really big, interesting problem (getting the 90% of information that’s in people’s heads onto the web in a way that’s usable). It’s still in closed beta, but there’s already some evidence that that’s happening. The real goal of Quora is to accumulate this valuable knowledge. It’s kind of like Wikipedia. This is the long tail of information. On Wikipedia people fight over what the text is going to say and it gets boring. Here you have none of that. You have conversations. I do think there’s a distinction between answers and discussion. The userbase seems to do a pretty good job of distinguishing between answers and questions and comments. One thing we talk about with the product is continually improving, and having the pages on the site be a good resource. If there’s a ton of different anecdotal answers, then someone comes along and summarizes all of that.